Is there any point in capturing ones you already have? I got 3 Drowzees all in the same area. Candy to evolve them for XP and to discover new Pokemon. Save your evolves and do them all at once when you use a Magic Egg to double your XP. Exchange your weak ones to the Prof to get candy to evolve or power up your strong Pokemon. I don't see that ending well for them, depending on where they are. If they did it for a day they already got more free advertising than it costs them. Took over a gym for the first time today. Bryant Park in NYC, which is about as nice of a location as you can think of here. Held it for a grand total of 3 minutes. Best character is an 1155 CP Dragonite. This is a pretty detailed, well-written guide for the game. It's meant for first-time players or people with some familiarity with the game, but not for experts. If you want to track a specific Pokémon from the guide in the bottom-right of your map, click on one. Then, once you're headed in the right direction, the guide will blink green (faintly around the border). If you don't see green you're not walking in the right direction. ^Which border? That purple ring that pulses? Or something else? The border around the small menu where the nearby Pokemon is. If you look closely and spin in a circle, it should quickly blink green. I serve a United Methodist church. 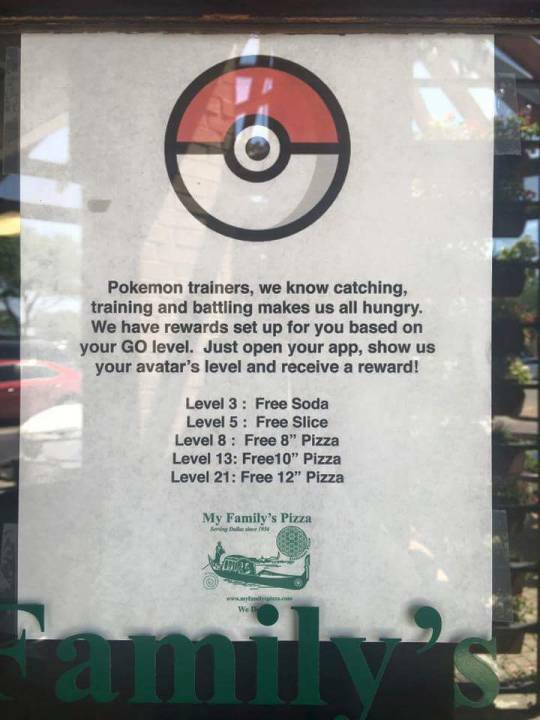 We had at least 30 people stop by over two hours, plus people would walk in saying there are people outside the building trying to catch Pokemon, too. I know it's possible because I did it the other day, too. Walked out and encouraged people to come in if they'd like and some did, especially when they found out we have pizza. The people who were there the whole time caught at least 50 Pokemon, easily. The big hit was when everyone caught Meowth. Pizza and other snacks when quick. Fun way to meet people from our neighborhood. I'd do it again. Your church has a pokemon spawn? The church my family goes to is a gym and I don't think any pokemon spawn near it. Sounds like your church was doing the catching. App question - on Android, Moto X. How do I shut down the app? I don't want it running all the time in the background (do I?) and for some reason I can't find an 'exit' or anything. I get my Back/Home/Apps buttons to overlay, hit Home a few times, then do the Apps thing and swipe it off. That's probably not killing the app entirely though. Just read that guide. There's a lot in this. Can the game be played entirely for free or will there be a paywall, either totally or practically? Click the ball at the bottom and that brings up the screen with Pokedex, Shop, etc. Top right is "Settings". Click that and then scroll to the bottom to "Sign Out". There's a practical paywall in the sense that once you're a higher level (15+) you will want to hold on to a fair amount of items and Pokémons at once. It costs real money to expand your inventory limits. I liked the game a lot and spent $10 on it (less than a cocktail I would drink in 5 minutes) and expanded my inventory. I haven't been able to open it today, the loading bar won't get past 20% before I get an error. I don't think it's local stations nice my wife has been on several times today. Anyone else with this error? Man playing Pokémon GO wanders up to police station, is arrested on outstanding warrant.